Make sure you take time to setup your new chair to suit your posture. Try different adjustments (the more you make, the more the chair will fit you). Colours shown here are a guide, however different monitor settings mean they may not exactly match the final product. 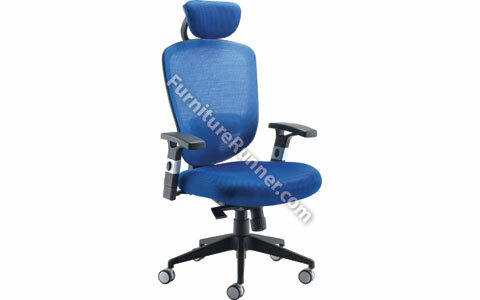 Arista High Back Chair with Headrest is a new contemporary mesh task chair offering style and flexibility. Recommended usage time 8 hours. Seat dimensions: W530 x D520mm. Back dimensions: W500 x H555mm. Seat height: 460-520mm. Adjustable arms included. This chair is suitable for all types of usage including Secretarial, Word Processing, Clerical, Professional, Accountancy and many more. The product is perfect for use whilst comfortably working at a desk, in front of computers for typically 8 hours a day.